Major projects are planned for Zambia, Ethiopia, Angola and Tanzania, and these countries will see large commercial poultry operations within the next three years. Namibia has recently established such an operation and created the commercial conditions for a limited period to help it become established. The poultry industry’s main challenges in Africa include lack of large quantities of maize, soya, day-old chicks and broiler producers or even farmers who could move into poultry. The high price of feed raw materials is equally an issue in Africa as it is everywhere. Delayed allocation of land and inadequate extension or advisory services to support developing farms are also major challenges. To overcome these constraints, government intervention is required, for instance, to build infrastructure such as roads, which need to be improved to allow heavy feed trucks and chicken transporters to move around easily in rural areas. While most poultry in Africa’s developing countries is still kept by smallholders, a strong and internationally linked poultry industry is evolving by utilizing economies of scale and technology from developed countries like South Africa. European influences are also present as logistics from Europe are easier than from South Africa. 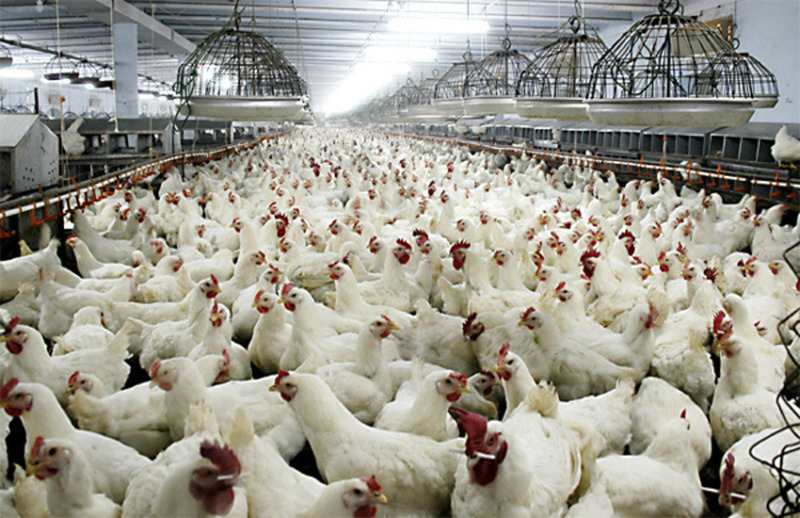 As in most developing countries, poultry production systems in Africa are a mix of family businesses and commercial operations, from the small- to large-scale with varying degrees of modern technology. The continent’s largest poultry meat producers are South Africa, which produces 1.5 million metric tons of chicken meat per year; Egypt with 685,000 metric tons; Morocco with 560,000 metric tons; Nigeria with 268,000 metric tons; and Algeria with 254,000 metric tons. When production figures are compared with the size of the national flock, contrasting levels of efficiency become apparent. While many African countries may be growing from a low base, they are nevertheless growing. This has clear implications for rising living standards and a greater demand for meat. Broiler production growth in a country like South Africa is about 3 percent per annum, while over the past 10 years the overall growth has been 38.8 percent. This is representative of most countries on the continent, but growth is predominantly through many small-scale producers entering the market. The consumer market in Africa is limited by poverty, low employment levels and slow growth of fast food chicken outlets, such as KFC and Nando’s. People simply do not have the money for this kind of purchase when they can feed a family of five with one live chicken purchased on a farm or market for less than half the price of a takeaway meal. Indeed, most parts of these chickens eaten at home are consumed. The pattern of meat consumption has changed significantly in Africa over the last 20 years. Beef used to be the most popular meat, but pork and chicken in particular have replaced this, with chicken now accounting for half of all meat consumed. This change in meat consumption has been driven in part by taste, but also austerity as consumers have looked to cheaper sources of protein. The factory yield of chicken in Africa is already very high. Figures of over 90 percent yield are not uncommon as almost all parts are sold, with only the blood and feathers discarded. Supply of raw materials, equipment, medication and vaccines, etc. The ban on GMO grains like maize is a big limiting factor to production as yields are lower, and the viability of Africa’s poultry industry is reduced by its high production costs and increased chicken imports. Local producers must be committed to increasing output and supplying fresh chicken to limit the import of chicken meat. As foreign nationals cannot own land, partnerships between current medium-size producers and foreign nationals with access to capital and technology are the way forward. If Africa creates a more friendly business environment, the poultry industry will grow and attract more investment to the continent.